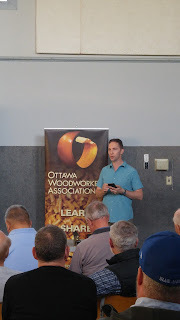 The next meeting of the Ottawa Woodworkers Association is about to be held on Tuesday, April 2, from 7 to 9 PM. Our feature presentation is from none other than Robin Lee, President and CEO of Lee Valley Tools and Veritas Tools. Robin will share his take on the state of woodworking in Canada. Bring indoor shoes, cash for 50/50, items to swap, sell or give away, and something for show & tell. Doors should open as early as 6:30 if you'd like to help set up. If you're curious about what goes on in this club, you may attend a couple of meetings, free of charge, before commiting to join. Just register as a guest with Jeff at the door. And a follow-up to George's offer of a plastic hook-plate from March: "In March's meeting I wanted to give a plastic hook-plate to anyone who uses David Charlesworth's Ruler Trick. Evidently Brian Greene got to you first as no one admitted to using the Ruler Trick. After the meeting, however, I was approached, confidentially, by a couple of members who, in hushed tones, expressed interest in the hook-plate. Thinking there was latent interest that maybe just needed a month's incubation, I made a bunch more and will give them away in April. The ruler trick is for sharpening-honing plane irons -- but never chisels -- on sharpening stones. The links scattered about in this paragraph all point to the same thing: if clicked they will run Charlesworth's video in which he explains his Ruler Trick. The plastic hook-plate can be used instead of a 6-inch Starrett rule if a) you're not sure about laying your rule on a wet stone; b) if you'd like a dedicated tool for your sharpening station but do not want to keep a precision instrument there; or c) if you want a 1 mm thick platform to stay perfectly in place while you use it." Are you geared up for the 2018-19 season of meetings of the OWA? Has the finish properly hardened on your summer opus for Show and Tell? No problem if you need an extra week, since our first meeting for 2018-19 will be on the .S.E.C.O.N.D. Tuesday in September, the 11th. We move back to first Tuesdays in October. Meetings run from 7 to 9 PM, and doors usually open at 6:30 if you'd like to help set up. We meet at the Western intersection of Baseline and Centrepointe, in the basement of the Bethany Baptist Church.